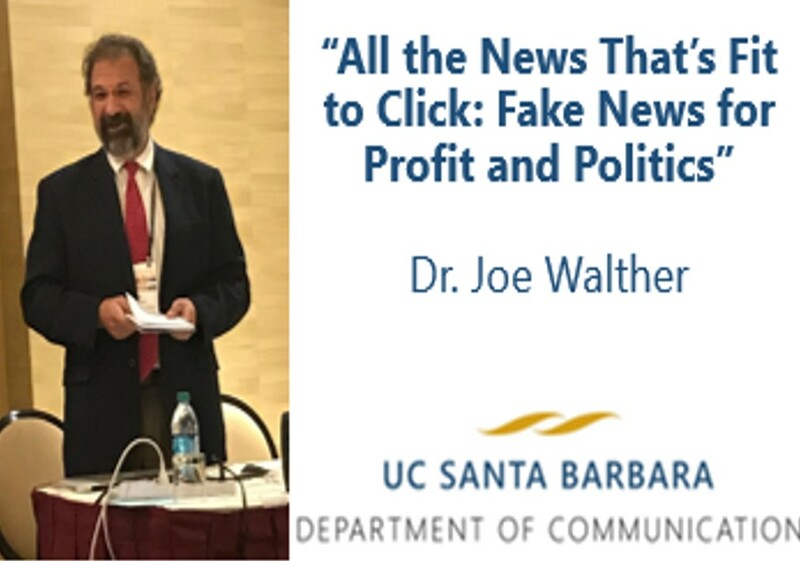 Join UCSB alumni, parents, and friends for a reception and a spirited discussion on the fake news phenomenon, its effect on society, and the simple step everyone can take to combat it. This talk provides highlights of the process and findings that went into the Citizen’s Guide to Fake News website. We’ll examine how fake news online differs from misinformation in the past, how the commercial motivations that led to the propagation of fake news paved the way for its appropriation for politics, why fact-checkers offer limited help, and other key points from the recent publication from the Center for Information Technology and Society. Dr. Joseph B. Walther holds the Mark and Susan Bertelsen Presidential Chair in Technology and Society. He joined UC Santa Barbara in November 2017 as a Distinguished Professor in Communication and Director of the Center for Information Technology and Society. A behavioral scientist and theorist, his work concentrates on how people form and manage impressions via the Internet; how they get to know others and decide who to like or trust, and how they develop relationships online that affect their work or social roles. Applications of his work in personal relationships, online groups, education settings, and inter-ethnic conflict have had a significant influence across a number of fields. Prior to joining UCSB, Professor Walther was the Wee Kim Wee Professor in Communication Studies at Nanyang Technological University, Singapore; and previously at Michigan State University, Cornell, Northwestern, the University of Amsterdam, and Manchester University.